Why Has Covered Call Writing Become So Popular? Ask The Baby Boomers! I’ve been writing covered calls since the 1990s. None of my friends or relatives ever heard of this strategy and no one I knew was using it. Back then, there were very few books on the subject and average retail investors had little or no interest in learning about this strategy or options in general. It is for the Wall Street Fat Cats, many thought. All that has changed because of the explosion of the baby boomers onto the options trading scene. Quality education is now available, options products are growing in numbers and improving in caliber and the playing field is leveling out for retail investors. Besides these factors, many boomers were planning to retire until the debacle of 2008 threw a monkey wrench into those plans. They needed choices to compensate for those losses. So what does a typical options trader look like? 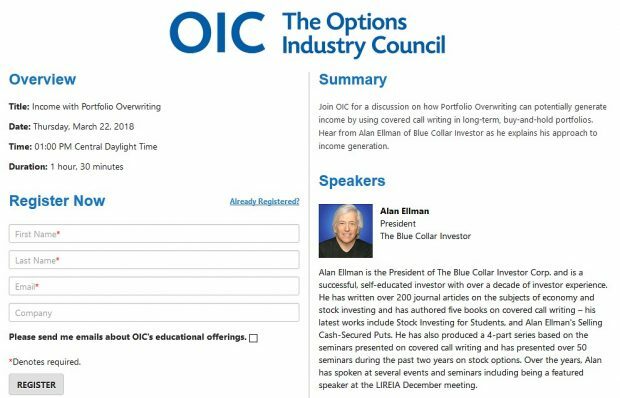 According to the Options Industry Council, the average options trader is 53 years old and 28% of all traders are between the ages of 55 and 64. Furthermore, these investors are driving up options trading volume by 16% over the past 10 years according to the OCC (Options Clearing Corporation), the world’s largest equity derivatives clearing organization. The common motivating threads seem to be to generate income to facilitate retirement and to make up for lost resources from the recession of 2008. Brokerage firms like TD Ameritrade, E Trade and Charles Schwab Corp. have enhanced their options trading platforms to take advantage of this exploding market. The ballplayers want to play, the ballparks are available and ready and the cost to get in (aka trading commissions) are lower than ever. Play ball! So why covered call writing? Options trading can be risky. It can also be a low-risk way to generate a decent monthly cash flow. “No grand slam homeruns with covered call writing” as I say in my books…just singles and doubles. Most traders new to options could be overwhelmed with complex options strategies and should avoid them until well-educated and experienced in those areas. So they tend to favor more basic strategies and those that favor capital preservation. One such strategy is covered call writing. I all my years of interacting with options traders from all over the world, I have never experienced this level of interest I am seeing recently in covered call writing. I love it! One of the reasons is that this is a 2-part strategy, owning the stock and selling the option. Most neophyte options traders are fairly well versed in part I. They are half way there! This is appealing to many as opposed to learning an investment strategy completely foreign to them. Most boomers already own a portfolio of securities so all they have to do is start selling the options and watch all that cash roll in…right? Well, it’s not quite that easy but you get the idea as to why covered call writing is so appealing to many boomers. In my view, the advantages far outweigh the disadvantages but that’s a conclusion each individual investor must make for him (her) self. Options trading in general and covered call writing in particular has been gaining in popularity over the past decade mainly due to the interest by baby boomers. These retail investors are looking for ways to exit the work force and make up for losses incurred in 2008 from the collapse of the real estate and stock markets. Many of these boomers view covered call writing as a means of accomplishing these goals. For the week, the S&P 500 declined by 2% for a year-to-date return of 18%, including dividends. We are having a great time in San Francisco and will catch up with emails next week on our return to NY. This week’s Weekly Stock Screen And Watch List has been uploaded to The Blue Collar Investor premium member site and is available for download in the “Reports” section. Look for the report dated 08-16-13. We have finally found a middle ground between our legal counsel and those subscribers who want to be able to copy the Running List symbols to their own purpose built spreadsheets. Beginning with the current report, subscribers will be able to easily copy the Running List symbols to other spreadsheets. We have added a third section to the Weekly Premium Report, “Running List Symbols”. Although still in secured PDF format, we have been able to open the list so you can copy the symbols to your own spreadsheets.. We’ve maintained the same format…stocks that passed all screens in Bold, stocks that report in the current month highlighted in gold, and the number of weeks on the Running List in parenthesis next to the symbol. We’re tested this format with a number of subscribers and this seems to satisfy the need to be able to copy and paste symbols, while at the same time, satisfy our legal counsel. See the “Events” link on the top right side of this page for more live seminars. Alan, since I have studied your profitable system I have sort of wondered about mentoring, and whether I would need it, or just do without it. I can see that you have mentoring available, so can you tell me first how do I know if I need to have mentoring for covered calls?, is this for only after we lose money a few times, that it is then recommended for us to try it? Also how many hours(on average) is usually needed from your mentoring?, – after this is it then best to practice ourselves, or can live-trading then be possible if so desired? We do have a fantastic mentoring program that we are quite proud of. It is done via skype so that computer screens can be shared. As far as whether an investor needs this and how many hours will vary from one onvestor to another. To help determine this, a team member (trained by me) will call you to discuss a program to meet your specific needs and time frame. This first call is FREE. It is not necessarily only for those losing money because mentoring can also assist in raising profits to higher levels. This is an educational service we provide and not specific financial advice. If you don’t have 100% confidence that you have complete command of all aspects of the cc writing strategy this is a service you should consider. Paper-trading (practice trading) is always a recommended part of the educational process. Alan, I will have to have a think about whether I would need any mentoring help, as it is a bit soon yet anyway. By having this done through Skype this seems like a great way for people to understand it, by seeing what is actually happening on the screen and the process for this. – First what would you think is the best website for papertrading shares, as your website has listed a few good ones? – Do I need to put the shares and options on watchlists for papertrading, or can I just write them on paper quickly? – When I papertrade over a few months then is it possible to practice it every week, or should I just do it out until the expiry dates monthly? Fred, placing trades is easy. The learning comes from what happens when the stock doesn’t do what you expected it to do, when a corporate announcement comes out that you didn’t expect, when a financial crisis hits a country somewhere else in the world and the market overreacts, when Bernanke speaks, etc etc. It takes awhile for all of these things to occur at different times in the month and for you to learn how to deal with them in paper money. Also, do not start trading too soon in order to earn supplemental income. That’s a recipe for disaster. Trade with money you can lose. Many places teach that about 80% of your money should be invested with traditional stock and bond allocations. Then 20% can be used in higher growth strategies. This fits into that 20%. I love covered calls but in the end with this strategy you are stock picking every month and when a stock that you pick goes down, you lose money. Barry & Alan do an absolutely terrific job of increasing the probability that your choices will be winners. However, they can’t predict nor control the market so some of your choices will go down. This is a long-winded way to say that this is a great strategy to learn. Learn it well. Don’t just read Alan’s encyclopedia, study it. Practice practice practice. When you switch to real money use money you can afford to lose, just in case. If you do all of this, the odds are good you’ll become a happy camper. I have found that when we start something new it can be intimidating and time consuming at first. After a great education and appropriate experience (paper-trading) you begin to master the strategy and it begins to become second nature. Think back to when we first took our driver’s test and compare it to today. The time will be greater at the start then later on but the journey is well worth the effort for most. A few hours a month will get you much more than a days pay in most cases for those who have mastered the strategy. Steve/Alan, thanks for your contributions to answering my questions. Hope you or Alan can maybe let me know on this. I’m thinking of possibly comparing some papertrade websites through the Cboe website, as this is what I have just read you can do, to find which is the easier one to use. Then I can start doing some practice trades, possibly even on a weekly basis, and when(and if) I feel ready to trade real money then I may try it. This won’t be coming too soon though, because as Alan said it can be time consuming to understand! Speaking for myself, there is no one formula that is right for every single investor. Generally speaking having a good diversified investment mix should be an integral part of every investor’s portfolio goals. My personal portfolio consists of stocks, bonds, cash equivalents and real estate (both commercial and residential properties). In the stock portion of my portfolio covered call writing dominates because that is the low-risk strategy that I have had the greatest success with. I do have a few stock accounts outside of my cc writing accounts but these represent a small percentile. For many investors, real estate can be your home. It can also be RE-related stocks and REITs (real esate investment trusts). Most financial planners will simplify a portfolio into stocks and bonds and a common formula is that you deduct your age from 100 and that is the percentage of stocks in your portfolio. For example, if you are 30, you should be 70% invested in stocks and 30% in bonds. Some planners will use the number 110 which would change the balance to 80/20. The main takeaway is that asset allocation is important and the right mix for each investor cvan only be determined by the investor him (her) self…one size does not fit all! Fred, I completely agree with Alan’s comments about asset allocation so I won’t repeat that part of your question. Regarding 20% in higher growth, higher risk strategies, that too is in the eye of the beholder. And yes, for those that know how to trade options, these would fit into this category. However, here’s a pretty simple example. There are four strategies for doing covered calls and Alan has written about all of them. I’ll put them in the order that I think is lowest to highest risk/return. 1) I believe Alan calls this an overwrite strategy of buying a diversified set of dividend paying stocks that you monitor but hope to hold forever, e.g., PG, JNJ, WMT, ABT, etc. You sell out-of-the-money calls each month, quarter, or use LEAPS annually. The dividend is about 3% annually, the covered call is another about 3%, and the stock price growth is whatever it is. This is a very low risk approach to investing (if the market goes up long term). 2) A step up is to sell ATM or slightly OTM puts and collect the cash each month. If assigned, sell ATM or slightly OTM calls until called away. This can be done with stocks or maybe even better a broad ETF like SPY or IWM. If the market goes up long-term and if you have a long-term pers[ective, this will do well with a little more risk. 3) There is Alan’s core buy-write strategy of picking stocks each month that have a good probability of going up and sell calls on these. Alan has had long-term success with this and gets 3-5%/month. As I mentioned previously, the key is the stocks you pick have to go sideways or up that month. 4) The highest reward and highest risk approach is to buy a call that is several months out and sell a monthly call against this. Most people call this an in-the-money diagonal. It can also be done with puts as a bearish strategy. This one makes a lot of money when you’re right and loses a lot when you’re wrong. 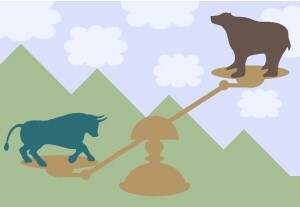 However, it can be used with very little capital and with both bullish and bearish stocks/markets. So Alan, would classify #3 as his low-risk bread-and-butter equity strategy. I would classify it as higher risk than the first two but it’s really what you’re comfortable with and have had success with. If you define risk as standard deviation in returns then #4 is clearly the highest risk. However, if you define risk as reward-to-capital then #4 is the lowest risk. If you define risk as returns over the long-term than again #4 might be for some people the lowest risk. As Alan concluded, one size doesn’t fit all and it’s got to be right for you.